Affordable 17.3-inch laptop. 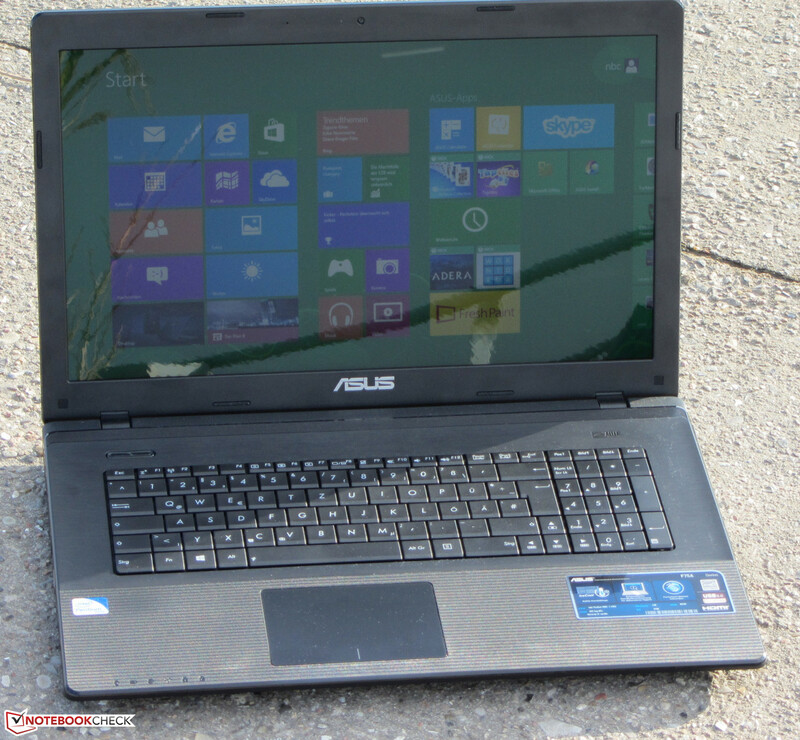 With the F75A, Asus offers a simple office notebook for around $480. Its 17.3-inch screen, Pentium processor, 500 GB HDD and Windows 8 are supposed to be sufficient for most users. Our review will show whether this claim is met. Cheap 15.6-inch office laptops (those selling for $500 or less) are not hard to find. In the case of 17.3-inch notebooks, the market seems to be less saturated. Accordingly, Asus has now released such a device - the larger brother of the 15.6-inch Asus F55A which we have already reviewed. Both laptops do not just look the same; even their features are very similar. We have put the F75A to the acid test. Two competitors, the Toshiba Satellite Pro C870 (Core i3-2350M, HD Graphics 3000) and the Medion Akoya E7221-MD98297 (Pentium 2020M, HD Graphics (Ivy Bridge)) serve as comparison. 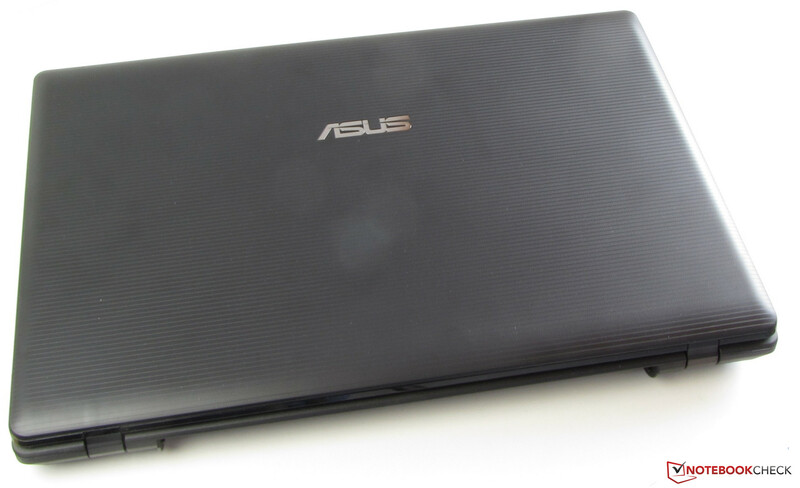 The F75A looks very much like the Asus F55A. Both devices sport a casing made of black plastic. Both the back side of the lid and the wrist rest are texturized so that they feel very slip-proof. The material used around the keyboard reminds us of brushed metal. We appreciate that Asus uses matte surfaces exclusively. Neither of its two competitors, the Satellite and the Akoya, employs anything else but plastic as well. There is not only an optical resemblance between the F75A and its smaller brother: Stability is also the same. 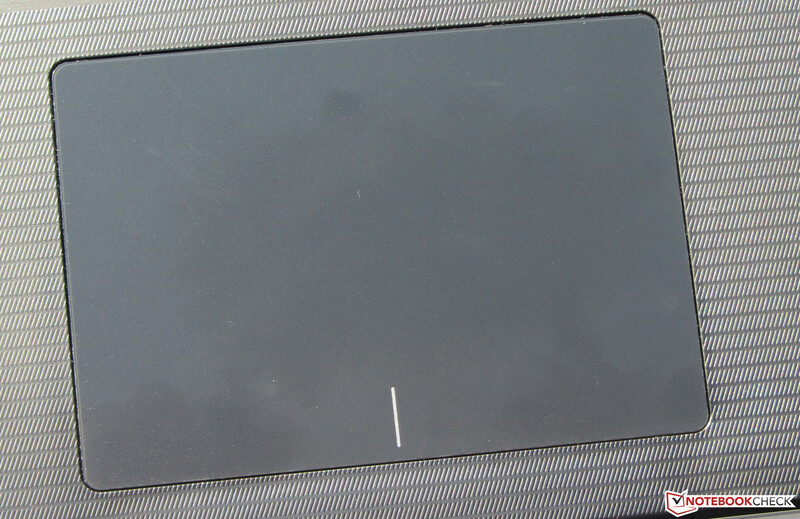 The base unit sags when pressure is applied to the area below the touchpad. The same holds true for the area to the left of the keyboard. At least, the casing seems to be rather torsion-resistant. It can only be twisted slightly. The lid behaves differently in this regard - it is very easy to bend. Also, the back side of the lid could have been sturdier. Its center can be forced to sag so strongly as to cause distortions on the screens. While the hinges may be prone to some bobbing, they are still capable of holding the display firmly in position. Thus, the lid cannot be opened with just one hand. Some issues with the build quality, e.g. a small gap between the DVD burner and the case, have to be accepted considering the price. The back side of the lid is slip-proof. There is little difference with respect to connectivity between all three laptops which we compare. All of them offer a standard selection of ports and have at least one USB 3.0 port. Unfortunately, the ports of the F75A are awkwardly placed. All of them are positioned at the front half of the left side. 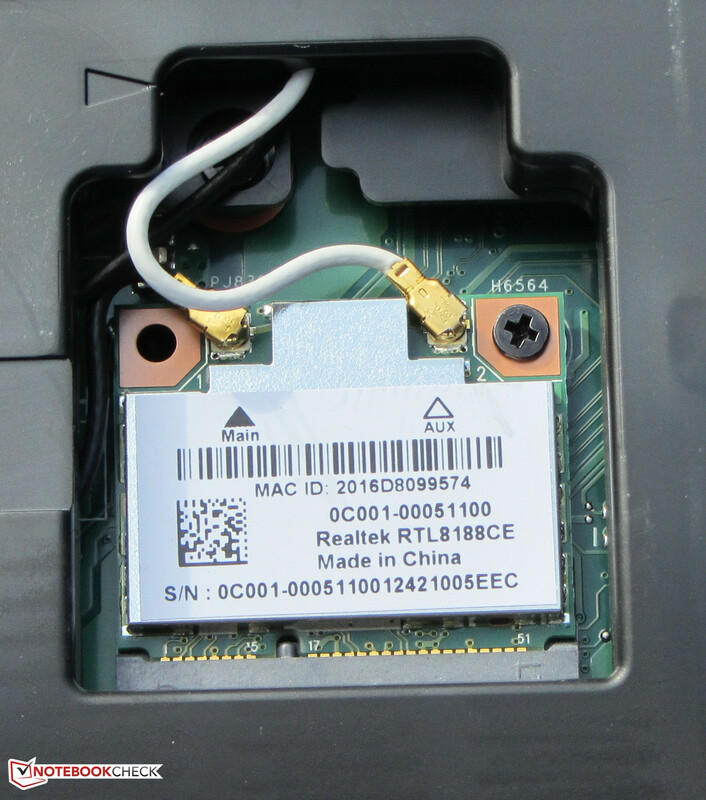 The Wi-Fi chip of the F75A is made by Realtek (RTL8188CE). It supports the Wi-Fi standards 802.11 b/g/n. We have no reason to complain about any reception issues, neither close to the router (approx. 3 m) nor two floors below (with 50% transmission power) does the connection get interrupted. 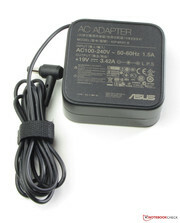 The Gigabit Ethernet chip in our Asus laptop comes from Atheros (AR8161/8165). There is no Bluetooth support. The F75A features a built-in 0.3 megapixel webcam (640x480 pixels), which disappoints due to its mushy image quality. The F75A ships with the usual documents: A hardware manual and a small brochure with warranty information. In addition, there is a 30-page Windows 8 user manual. Windows 8 (64 Bit) is preinstalled on the F75A, no Windows DVD is included. A downgrade to Windows 7 is still possible, since all necessary Windows 7 drivers can be found on the Asus website. In order to repair the system in the case of a malfunction of Windows 8, the recovery system can be accessed by pressing the key combination F9 while the computer powers up. The user can choose between a system repair and resetting it to its delivery condition. 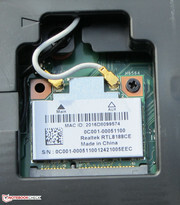 An opening of the maintenance hatch reveals the Wi-Fi module as well as the hard drive and the RAM module. The fan cannot be accessed. 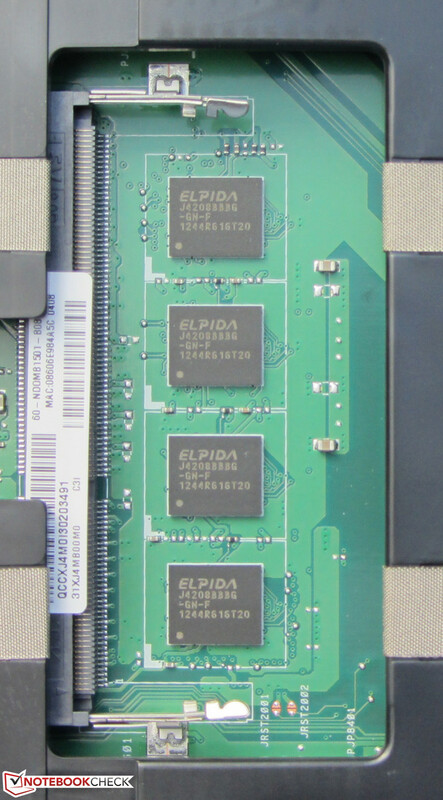 The F75A comes with just one memory bank which is not in use in our test device. Its 4 GB RAM is soldered directly to the motherboard. A test with an additional 4 GB module was successful and yielded smooth operation. 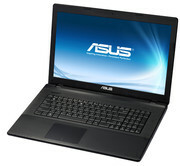 In theory, the F75A could be equipped with up to 12 GB RAM, however, the Asus website states a maximum of 8 GB in total. We recommend installing a second RAM module since this allows the RAM to be used in dual channel mode, thus fully taking advantage of both CPU and GPU. A 4 GB module can be had for around $25 - $30. Exchanging the hard drive should not be challenging. 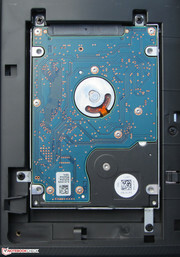 The retaining screws have to be loosened, whereupon the hard drive can be removed. Its cage can be attached to the new hard drive, which may then be inserted back into the device - that's it. 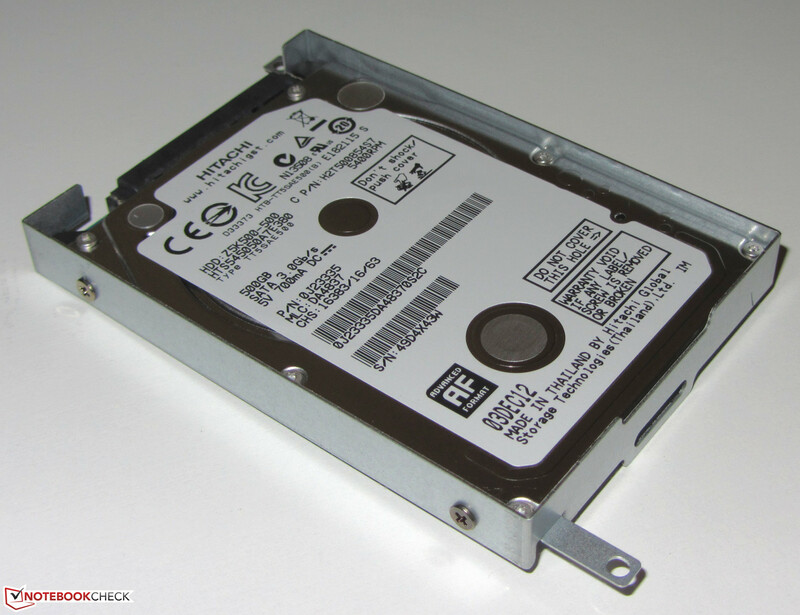 The F75A is equipped with a 7 mm HDD, however, the hard drive cage is 11 mm high and can also accommodate conventional 9.5 mm HDDs. The F75A comes with 24 months of warranty, the same as the Medion laptop, while users of the Toshiba notebook get only 12 months. Warranty of the F75A can be extended to three years for around $100 - this has to be acquired and activated within the first 180 days after purchase. The F75A utilizes the same conventional keyboard as the F55A. All major keys are flat and approximately 17 x 14 mm large. Their lower side exhibits an angle. The keys offer medium travel and their pressure point is fine, but they show too little resistance. A more rigid suspension would not have hurt. The keyboard is neither very silent nor very noisy, but it wobbles significantly while typing. The multitouch-enabled clickpad is another old acquaintance from the F55A. Its luxurious size of 10.5 cm x 7.3 cm makes using multitouch gestures a breeze. Its smooth surface allows the fingers to glide effortlessly over the touchpad. All gestures can be activated or deactivated individually in the configuration menu. As with all clickpads, there are no separate mouse buttons. The position - whether one taps in the lower left or lower right corner - determines which action is supposed to commence. The touchpad offers short travel and a clearly tangible and audible pressure point. 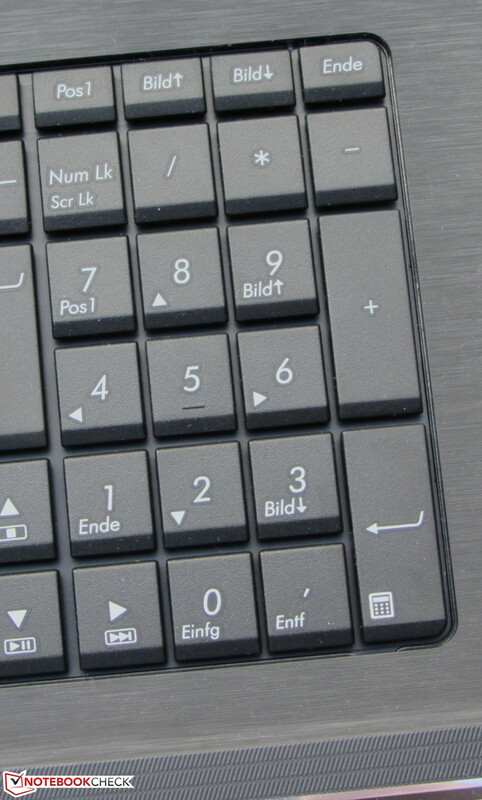 The F75A comes equipped with a conventional keyboard. 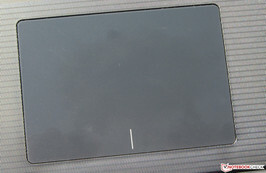 The touchpad is capable of multitouch recognition. The glossy 17.3-inch display of the F75A is made by Samsung, offering a native resolution of 1600x900 pixels. There is no option for a different display panel. Average brightness is just that, average, with 219.9 cd/m². Both the Satellite (235.4 cd/m²) and the Medion laptop (279 cd/m²) fare better in this regard, and they offer matte displays. Even its illumination value of 79% is worse than that of its competitors (Medion: 91%, Toshiba: 87%). Both contrast (291:1) and black levels (0.86 cd/m²) do not manage to convince us of the qualities of this display. Again, the F75A is left standing by both the Satellite (362:1, 0.86 cd/m²) and the Akoya (412:1, 0.69 cd/m²). 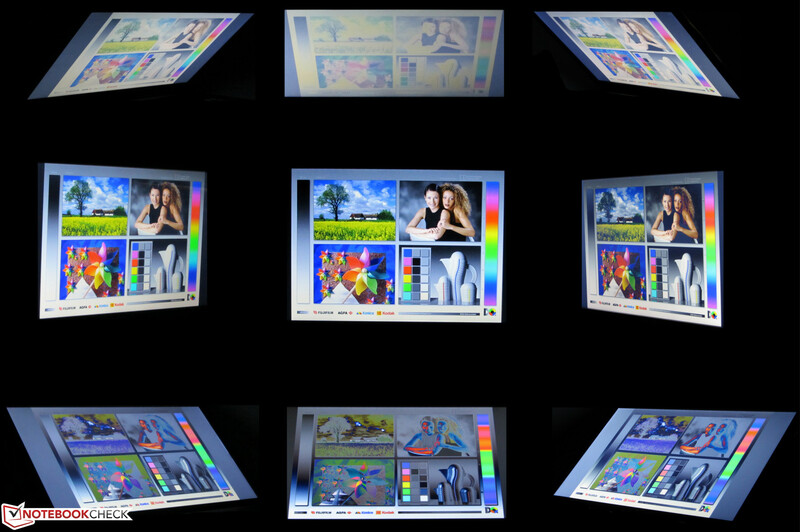 The display of the F75A fails in reproducing the AdobeRGB and the sRGB color spaces. We have examined the screen in its delivery condition (target color space sRGB) and measured severe DeltaE-2000 deviations for white, cyan and the grayscale, but this does not imply that the other colors are capable of reaching the target (DeltaE smaller than 5). The display suffers from a very noticeable bluish cast. Display brightness is barely sufficient for outdoor usage, and only so in the shade. The glossy surface and the low contrast ratio work hand in hand to further exaggerate this effect. Viewing angle stability is as could be expected at this price point. Vertical movement quickly leads to a deterioration of color reproduction. This problem is less pronounced in the horizontal direction so that the contents of the screen can still be read from an angle, albeit becoming darker. 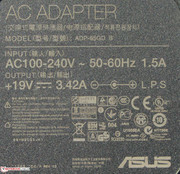 Viewing angles of the Asus F75A-TY089H. 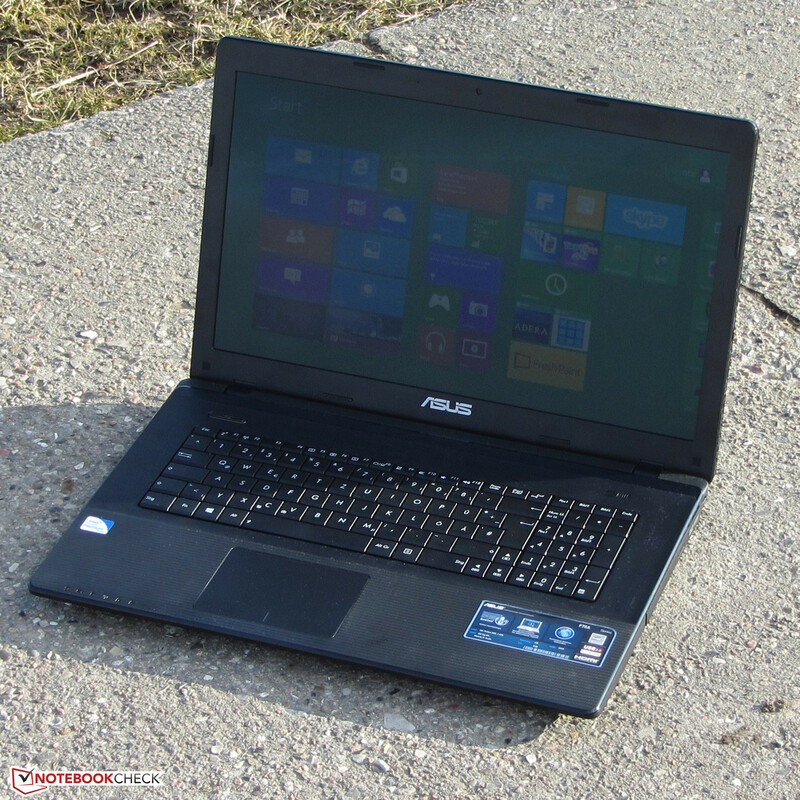 The Asus F75A in outdoor usage. The F75A is content with being a simple office laptop. The CPU performance of its Pentium processor should be sufficient for most applications. Surfing the web, working with office documents, communicating online, video playback - all these tasks run effortlessly. 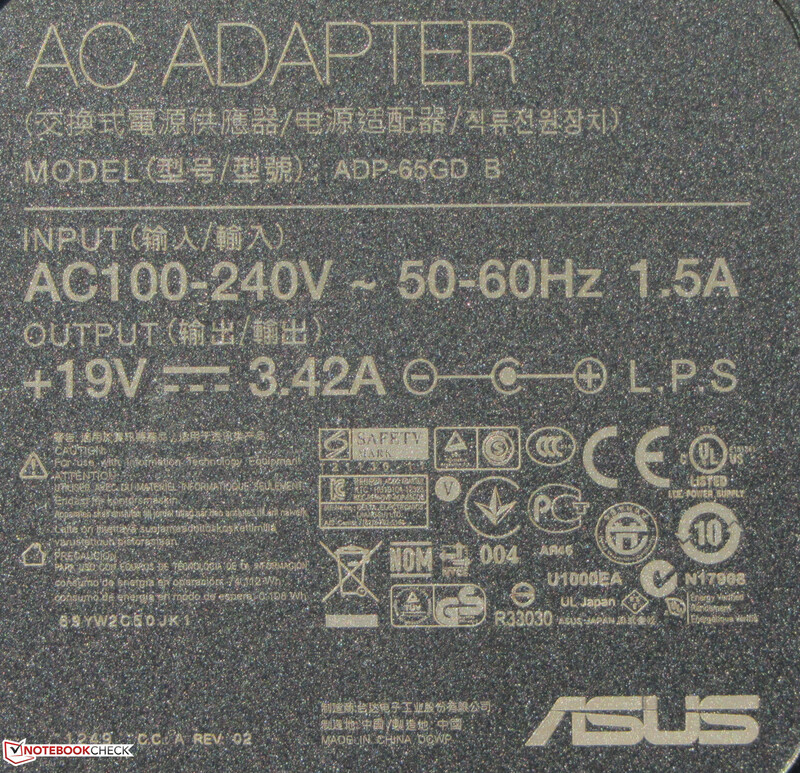 The Asus laptop is also capable of handling full HD videos (1920x1080) and H.264-coding. At the moment, the price of the F75A-TY089H lies between 390 and 450 Euros (~$503 and $581). 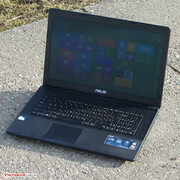 Several other more expensive models of the F75A series are also available for 420 to 580 Euros (~$542 to $749), differing in the equipped CPU (Pentium B970, Core i3-2370M) and their hard disk space. The Asus notebook is driven by an Intel Pentium B980 dual-core processor, a representative of the slightly older Sandy Bridge processor architecture. It is clocked at 2.4 GHz, but there is no turbo boost mode. The CPU is capable of handling the Cinebench test at full speed, so that its results fall in the expected range. The Pentium CPU used in the Akoya (Pentium 2020M, HD Graphics (Ivy Bridge)) is faster due to its Ivy Bridge heritage, but the crown goes to the Satellite (Core i3-2350M, HD Graphics 3000) as it employs a (Sandy Bridge) Core i3 processor. 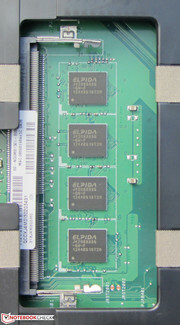 The Akoya thus trumps the Satellite at single threading tasks thanks to its Ivy Bridge architecture. The same picture holds true for the GL tests. Again, the F75A cannot compete against the Satellite and the Akoya, which turns out to win this round due to its dual channel RAM. The Intel GPU profits considerably from this boost, and accordingly, the Satellite and the F75A could benefit as well if they didn't employ single channel RAM. We have actually tested this - and indeed, an additional RAM module installed into the F75A improved its results in the GL test of the Cinebench R11.5 by approx. 15%. The system runs smoothly without bogging down. The results of the PC Mark 7 benchmark corroborate this empirical observation. Again, the Akoya (Pentium 2020M, HD Graphics (Ivy Bridge)) manages to get better results due to its faster processor and the fact that its RAM works in dual channel mode. Indeed, a second RAM module was able to increase the benchmark results of the Asus laptop by 9%, boosting them to 2255 points. Its smaller brother, the F55A yields considerably worse results (1678 points for the PC Mark 7 benchmark), despite its similar configuration. The faster HDD used in the F75A makes all the difference. Our Asus F75A is equipped with a Hitachi Travelstar Z5K500 hard drive, rotating at 5400 revolutions per minute while offering a capacity of 500 GB. As usual for Asus, the HDD is divided into an OS partition (186 GB), a data partition (258 GB) and a recovery partition (20 GB). CrystalDiskMark yields a read speed of 196.2 MB/s while HD Tune measurements of the transfer rate hover around an average 82.8 MB/s. Both values are not to be underestimated, given that this is a 5400 rpm HDD. Graphics output is handled by Intel's HD Graphics (Sandy Bridge) GPU. It supports DirectX 10.1 while working with clock speeds between 650 MHz and 1150 MHz. At the time of writing, this is the weakest GPU in Intel's product portfolio. The F75A always fares worse that its competition in all the different 3D Mark Benchmarks. This does not come as a surprise, as it sports the weakest GPU. The GPU performance of the Akoya (Pentium 2020M, HD Graphics (Ivy Bridge)), on the other hand, is sandwiched between that of an HD Graphics 2000 and an HD Graphics 3000 GPU. Still, the Akoya ends up achieving better 3D Mark results than the Satellite (Core i3-2350M, HD Graphics 3000) - again due to its dual channel mode memory. Additionally, the Akoya's Intel GPU is the only one of the three that supports DirectX 11. Again, the 3D Mark benchmark results of the F75A can be boosted by installing a second memory module, yielding a 25% increase in 3D Mark 05 and 06 as well a 10% increase in the 3D Mark Vantage benchmark. Elaborate 3D games are no particular strength of the Intel GPU used in the Asus F75A. Some games can be played with a low resolution (1024x768 pixels) and low quality. Other games, such as FIFA 13, which do not tax the graphics card as much, may also run smoothly with higher resolutions (1366x768) and medium graphics quality. Again, a second RAM module can boost the frame rates of all the games we have tested by benefitting the Intel GPU with its dual channel mode. This results in 10 to 20% higher frame rates, but still, Anno 2070 and Skyrim remain unplayable. FIFA, however, profits tremendously, seeing frame rate boosts of 33 and 21% with medium and high quality respectively. If one is looking for a cheap, yet capable gaming laptop offering 17.3-inches of display real estate, both the Packard Bell EasyNote LV44HC-137GE (Core i5-3210M, GeForce GT 630M) and the Sony Vaio SV-E1712F1EW (Pentium B980, Radeon HD 7650M) might be worth a glance. They cost around $700. 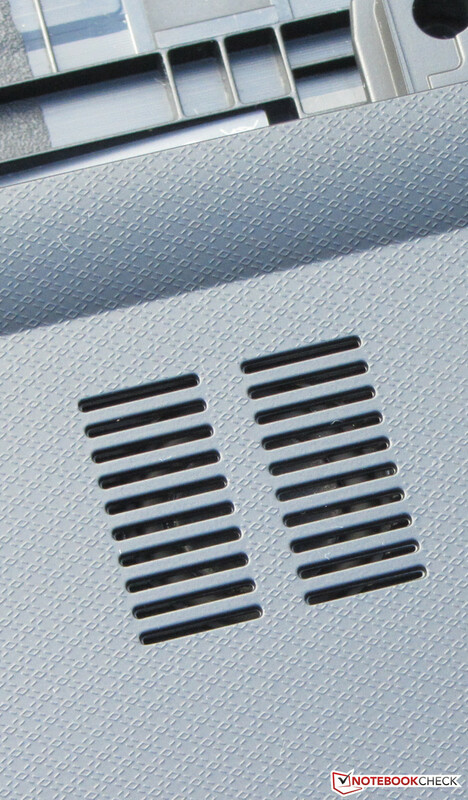 Due to its negligible sound emissions, the F75A is perfectly suited for quiet environments. 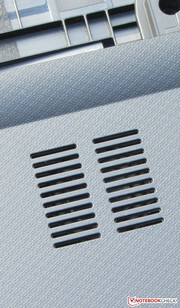 While idle, noise levels lie between 30.8 and 31.8 dB. The Akoya (30.4 to 30.5 dB) is even quieter, while the Satellite produces more noise (33.1 to 33.4 dB). Even under medium (3D Mark 06 is running) or full load (stress test, both Prime95 and Furmark are active), the F75A still remains rather quiet, emitting 32.6 dB and 38.6 dB respectively. The Satellite is far louder (38.2 / 40.8 dB) while it is again the Akoya that takes home the crown (31.2 / 35 dB). 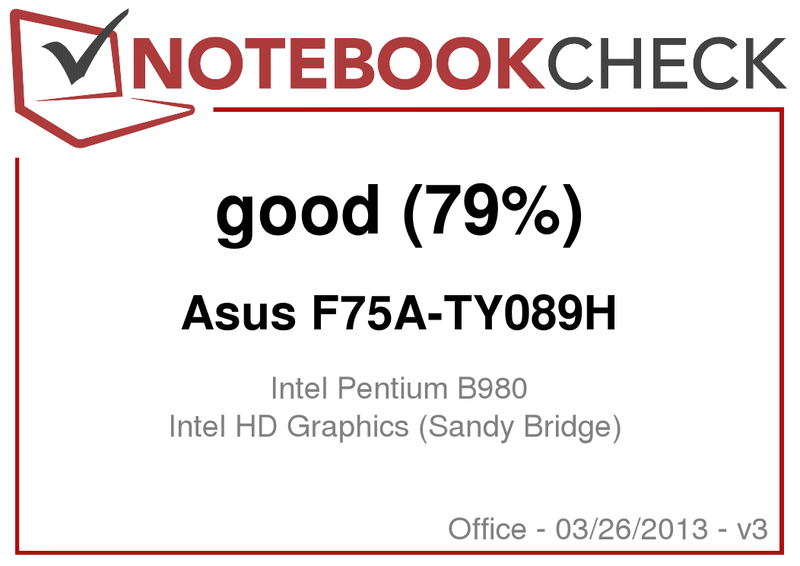 The Asus F75A during its stress test. The F75A exhibits no problems with excessive heat. Temperature remains between 25.6 and 33.6 °C while idle. A moderate growth of these values can be observed under full load, with temperatures of up to 22.2 to 40 °C. The maximum is measured underneath the laptop, close to its fan. Thus, the F75A never runs too hot not to remain usable on one's thighs. The same holds true for both the Akoya and the Satellite, which get approximately as warm as the F75A. 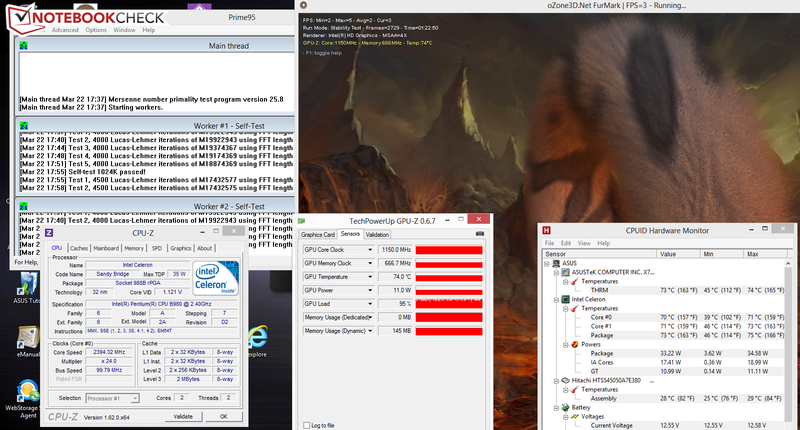 The CPU remains clocked at 2.4 GHz during the stress test (Prime95 and Furmark are both running for at least one hour). While the GPU gets throttled down to 650 MHz during the stress test while running on battery, it can use its full 1150 MHz when the power adapter is plugged in. In that case, the CPU temperature reached a plateau at 70 / 71 °C. 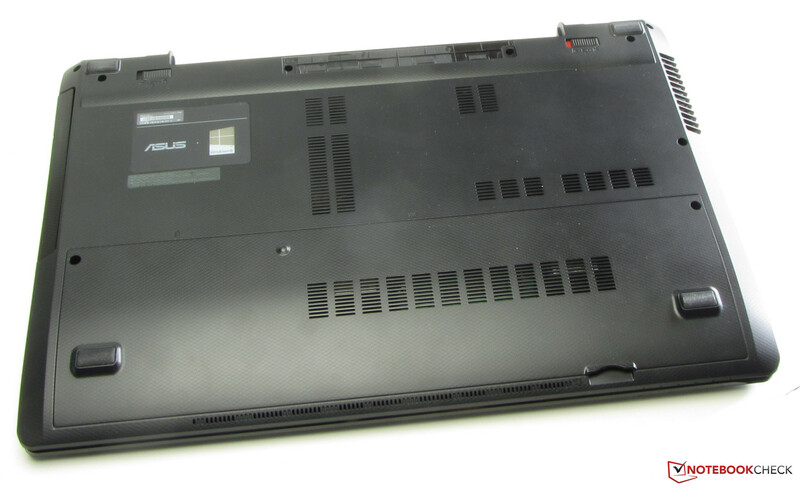 The stereo speakers of the F75A are positioned on the underbelly of the laptop. Their sound is very pleasant and full of riches which even hint at the existence of some bass. It is no problem watching an entire movie without resorting, irritatingly, to external solutions. 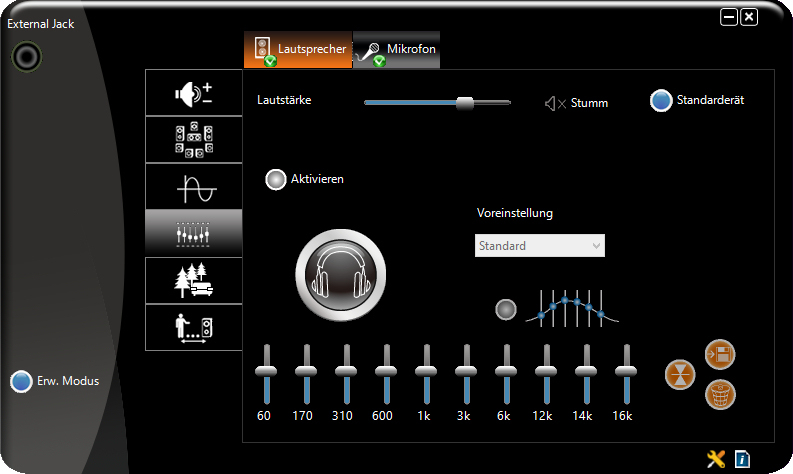 Further fine-tuning of the sound output becomes possible with the help of the preinstalled Via HD Audio Deck software, but of course the option still remains to plug headphones or external speakers into the F75A's 3.5 mm port. Power consumption while idle is somewhere between 10.4 and 16.6 watts, which is actually more than what one might suspect given the hardware of the Asus laptop. Both the Satellite (8.2 to 14.8 watts) and the Akoya (9.5 to 14.3 watts) settle for less. Under medium load (3D Mark 2006 is running), the F75A consumes the least with 27.6 watts (Akoya: 32.1 watts; Satellite: 41.4 watts), while it takes the middle spot under full load with 47.3 watts (Akoya: 41 watts, Satellite: 53.3 watts). The F75A manages to squeeze 5:25 h out of its battery while idle (as measured using the Battery Eater Reader's Test, with minimal brightness, activated energy saver profile and deactivated modems). Both the Akoya (5:43 h) and the Satellite (6:15 h) achieve longer battery life. Under full load, the F75A only lasts 1:05 h - again less than the competition (Akoya: 1:32 h, Satellite: 1:16 h). Here, the Battery Eater Classic Test has been used, running the screen at full brightness, turning on the performance profile and activating all modems. The F75A hangs on for 3:29 h during the Wi-Fi test, a little bit less than the Satellite (3:53 h) and the Akoya (3:43 h). In this case, a new website loads every 40 seconds, the energy conservation profile is active and the display brightness is set to 150 cd/m². During DVD playback, the battery life of the F75A comes down to 2:45 h, on a par with the competition (Akoya 2:44 h; Satellite 2:58 h), which also stay below the 3 hour threshold. This test is performed while the energy saver profile is active (or a higher profile, if the DVD cannot be rendered smoothly), screen brightness is at full strength and all modems are deactivated. 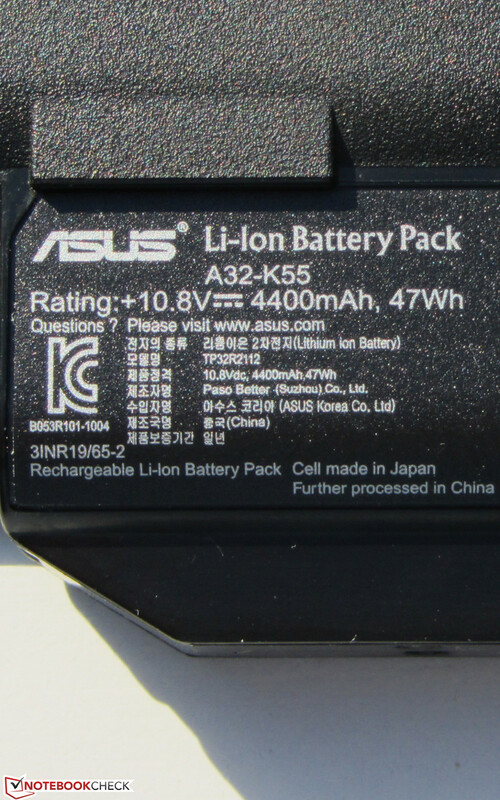 The battery life of all three devices is easily comparable since their capacity is roughly the same (Toshiba: 48 Wh, Medion and Asus: 47 Wh). The F75A can be recommended to all users looking for the most affordable 17.3-inch laptop. Its application performance is solid, it runs quietly and does not even get hot, thus qualifying itself for usage in the office. Of course, a matte display would have been helpful in supporting this claim. Then again, a price point of less than $500 necessarily brings along limitations, for example the F75A's low-contrast display. The keyboard is also far from top-notch, wobbling visibly during usage. Both the Toshiba Satellite Pro C870 and the Medion Akoya E7221-MD98297 might be good alternatives if a matte display is desired. They are also endowed with more computing power. The hinges keep the lid firmly in place. ...and yields a maximum power of 65 W.
...and holds 47 Wh of energy. Nice: The F75A comes equipped with two Wi-Fi antennas. Both thick (9.5 mm) and thin (7 mm) hard drives fit within the HDD cage. The hard drive can easily be exchanged. There is one unused memory bank. Sound output can be customized with the VIA Audio Deck software. The speakers are positioned underneath the notebook. 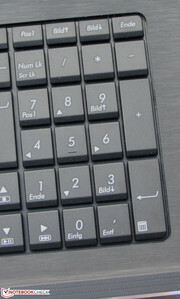 The keyboard includes a number pad. 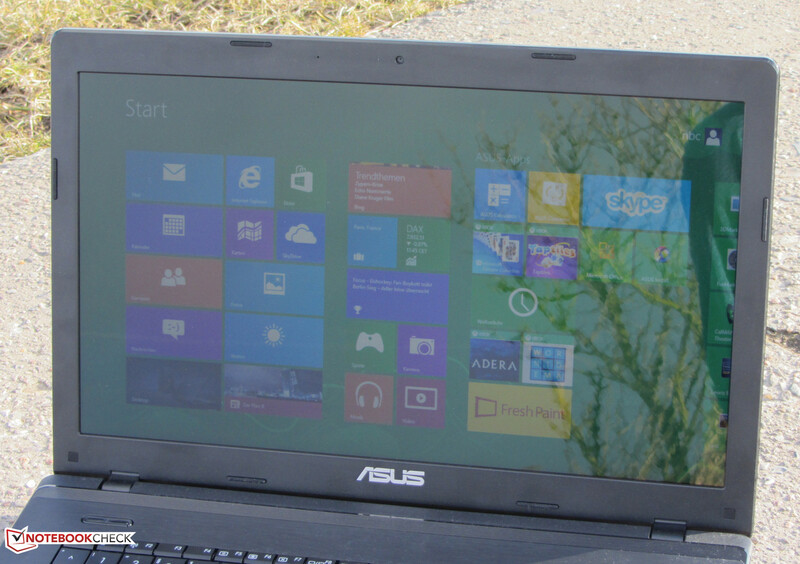 The Asus F75A used outdoors. The F75A remains silent and cool. 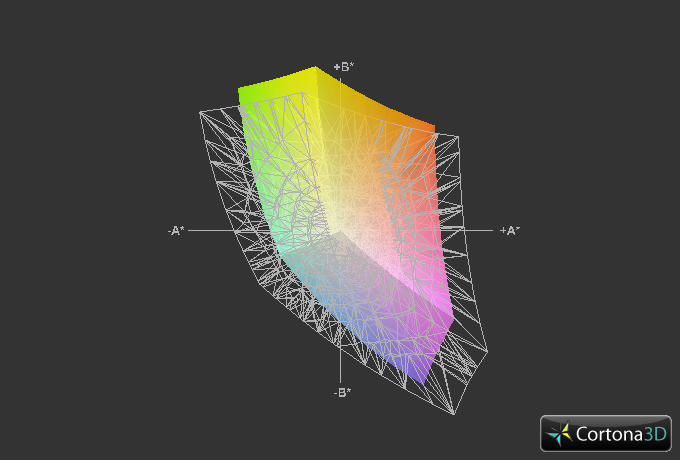 A higher contrast ratio for the display. A matte screen would be nice. The speakers of the Asus F75A offer a very pleasant sound, as did those of the F55A. Audio quality is often far worse even in much more expensive notebooks. 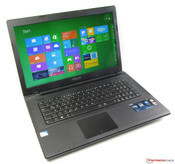 Toshiba Satellite Pro C870, Packard Bell EasyNote LV44HC, Lenovo IdeaPad G780, Samsung Series 3 305E7A-S03DE, Acer Aspire 7739Z-P624650MNKK, Sony Vaio SV-E1712F1EW, HP Pavilion g7-2053sg, HP Pavilion g7-2051sg, Packard Bell EasyNote LK11-BZ-080GE, Medion Akoya E7221-MD98297.